Japanese restaurants were the 'in-thing' in the gastonomical Kuala Lumpur... almost everywhere... we were able to find Japanese Restaurants. Some were classier and posh than the rest... Some restaurants were decorated with little Japanese trimmings and yet called themself Japanese Restaurant. ﻿I would order a plate of Yakisoba or Japanese Fried Noodles... almost everytime we ate at Kiri-Te. It's one of my favourite Japanese noodles. 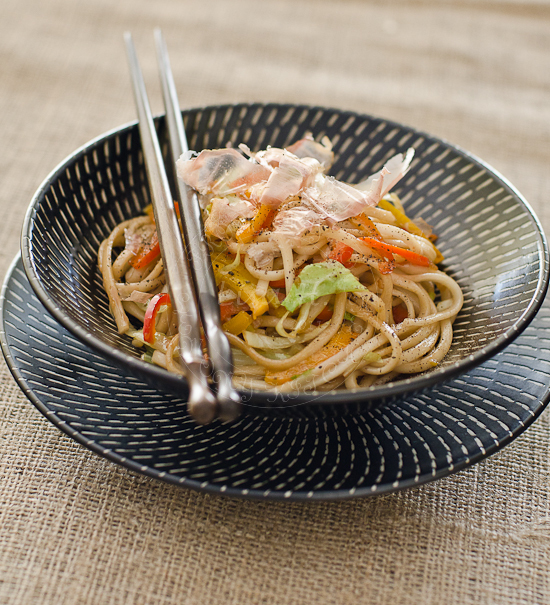 I crave for Yakisoba over any other noodles for its subtle flavours... everything seems to blend harmoniously. Cook the udon as per packet instruction. Heat 1 1/2 tablespoon of oil in a wok and stir fry the chicken until it is just cooked. Remove from wok. Wipe the wok with absorbent kitchen paper. Add the remaining oil to the hot wok, add garlic, ginger and cabbage. Stir fry for 1 minute. Add beansprout, stir for another minute then add red and yellow capsicum. And stir fry for another minute. Stir-fry until all heated through. Serve immediately and sprinkle with black pepper and garnish with bonito flakes. Those noddles look delicious! Nice flavors. Lovely picture and delicious noddles. Lovely dish! I'd love to take your recommendation, hopefully we have the capacity to dine in this restaurant if we are to visit K.L. again... lots of foods to enjoy ... : ). Looks good! I love the addition of bonito flakes! I can eat this anytime. Looks very delicious....mmmm. Love the seasoning. I love the combination of textures in your photo. It looks like the bowl in spinning sort of but the noodles are staying still. Lovely. 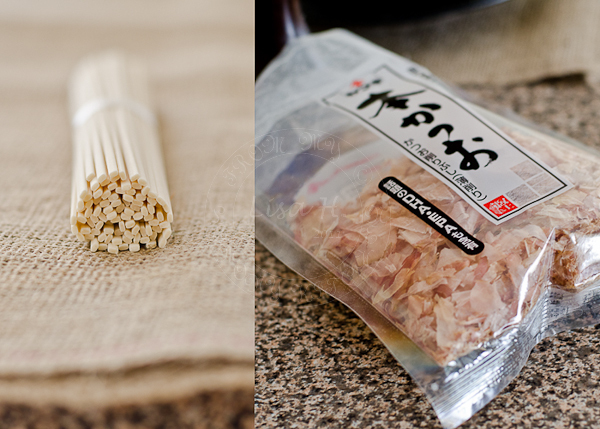 BTW, I had to chuckle at the photo of your package of bonito flakes. When we lived in Japan, my son thought they were bits of bacon. He loved the rice because it came with "bacon" on top. It was years later that we told him the truth!! I love this recipe, but I don't know were I can find bonito flakes where I live. You have such amazing photos and I just know the food is delicious! I am not well-versed when it comes to Japanese noodles, and thank you for this post, I learned something new. I just wish I read this before grocery shopping earlier. Love it Lisa...! Can make my own after this...I once ordered a Yakisoba at a so-called Japanese stall in one of the food courts in Doha and they used Rice noodle (pad thai) instead...ada ka patut? I never return to the stall ever again! hi lisa, i havent seen these dry type of udons or probably it's there just that i missed that. the ones that i normally see is the fatter type that's in packets form. this really sounds delicious to me! I was browsing on your blog and found this recipe and I wanted to say how delicious it looks and sounds! Yakisoba is definitely my favorite noodles (among Japanese food) but I have never made Yakisoba Sauce from scratch. As always your photo just grab me into your table and I can almost taste your food!! !